A third victory for Joan Barreda. Monster Energy Honda Team has now won half the stages of the Dakar 2017. 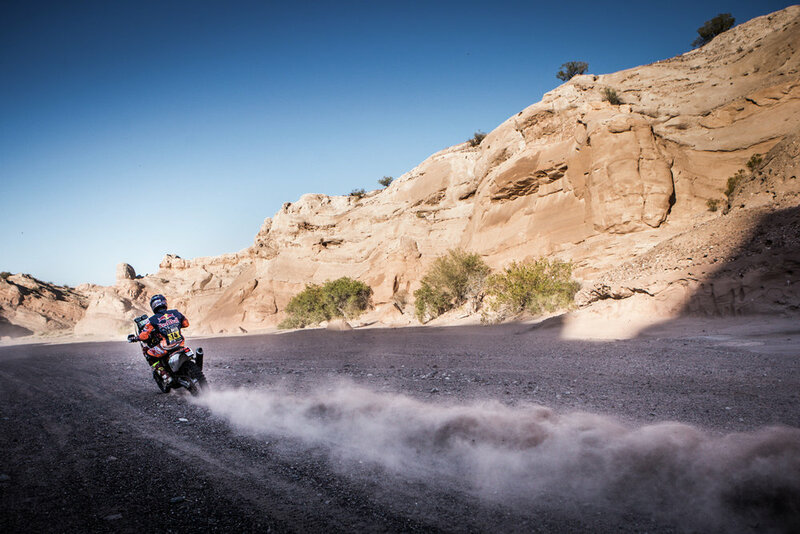 The natural disasters of two days ago in Jujuy and the cancellation of the ninth stage yesterday are now history and today the Dakar Rally was back on its scheduled route. In the suffocating regions of La Rioja and San Juan, the Monster Energy Honda Team grabbed the glory with a stage win. The Dakar got back to relative ‘normality’ with a full-length stage, free from diversions or detours. The 449 kilometers against the clock on the route from Chilecito-San Juan turned out to be the longest one disputed so far in the 2017 edition of the race. With baking 45-degree temperatures – even reaching 50 in the saddle – riders had to endure one of the most physically grueling stages, as well as having to deal with highly demanding navigation over the opening stretches of the stage. The second section – finishing in San Juan – was a speedier affair, albeit with technical complications. Riders will try and rest tonight in the heat of the El Zonda racing circuit. Joan Barreda opened the track throughout the day with near-flawless navigation except for a very slight deviation at kilometer 53. Luckily, team-mate Michael Metge was on hand to confirm the correct direction. Both, with the Honda CRF450 RALLY, were soon spearheading the field towards the destination in San Juan. Metge scored the day’s best time, clinching his first Dakar stage win in the process; although later he was sanctioned for having missed a waypoint. The French rider’s route is currently being subjected to scrutiny. The 2017 Dakar Rally on Thursday continued to surprise, and to exact revenge on the remaining field of 101 motorcycles in another stage that proved to be difficult for almost every rider. Despite losing time at the beginning of the timed special, Red Bull KTM factory rider Sam Sunderland held onto the overall lead at the end of the day, now in front of his teammate Matthias Walkner in second, even if both finished down the order in the stage results. The British rider fought hard on the KTM 450 RALLY to make up his lost time, but the fact that Pablo Quintanilla, Sam Sunderland’s closest rival retired due to illness in the afternoon, allowed him to finish the day with an advantage of 30 minutes in the standings. Second is now his Austrian teammate Matthias Walkner with Spanish KTM rider Gerard Farres Guell in third place, 38:43 minutes off the leading time. The Dakar Rally’s difficult stage 10 proved to be a game changer for the Rockstar Energy Husqvarna factory team on Thursday. While Pela Renet managed to move up to sixth place in the overall standings, it was the end of the rally for Pablo Quintanilla. The 2016 FIM Cross Country Rallies world champion stopped after 400 km, said to be suffering from a dizzy spell, and was receiving treatment from the medical team.